"Does it shoot?" That's the first question an enthusiastic kid asks as I test-fly the DJI Phantom 2 Vision+ in a London park. When the child's father finally catches up, his first question is: "How much is one of those?" In my incredibly short career as a drone pilot, I've been reminded how the human imagination withers with age. A couple of weeks with the DJI drone would teach me quite a few things; not only about human perception of these flying devices, but also about the future of our skies. The answer to the boy's question is no, it doesn't shoot... unless you're talking about video. The answer to dad's question is much less open to interpretation -- the Phantom 2 Vision+ costs $1,299, which includes a 1080p camera built in, plus a three-way brushless gimbal (the part that keeps the camera stable). The Vision+ is a ready-to-fly, all-in-one video-recording drone that lets amateurs like me record silky-smooth, almost cinematic aerial video. A fact that brings us to something of a fork in the road where drones are concerned. Remote-control drones have been used by the military, academic research teams, big-budget video productions and the private sector. They're also popular with home-brew and hobby enthusiasts, but other than the odd $50 toy, they've never really crossed over to the mainstream. DJI isn't the only company that makes consumer-friendly drones, but it's the company leading the market. Its Phantom models require no assembly, and are (relatively) easy to fly. They have an impressive flying range, a decent 20 or so minutes of airtime per charge and a host of other premium features (including GPS, return to home and different flying modes). The Phantom 2 Vision+, with its built-in camera and smooth video (the first Phantoms with cameras were marred by unstable footage), could bring quadcopters, aerial photography and a whole bunch of privacy issues firmly into public consciousness. 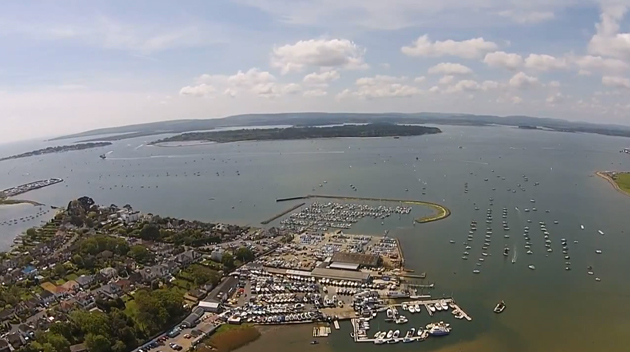 After my maiden flight, I take the Vision+ on a trip to the seaside town of Bournemouth, UK, on a sunny Saturday. It's mid-spring and a steady flow of ice-cream-holding day-trippers crowds the promenade; small groups of people dot the beach. I'll admit, I'm nervous about flying the drone. Am I allowed to? Are there laws against this (the UK Civil Aviation Authority has regulations, peppered with terms like "substantially" and "near")? These are the questions in my mind. The Vision+ shows you what the built-in camera sees in real time, often referred to as First Person View (FPV), through an app for your phone. The same app is where you change camera settings, angle (through 90 degrees) and swap between photo and video modes. It also locates your drone on a map (should it tank while out of sight), and displays battery status. If you have a GPS lock at takeoff, there are fail-safes that bring the drone back to you when battery levels are critically low. You don't want to rely on fail-safes, though. Having real-time info is immensely reassuring. That's until the connection between app and drone breaks. This happens one time as I'm flying above the sea. I still have full control of the Vision+; I just can't rely on FPV for navigation. Basic flying may be simple, but it's still easy to get in a pickle. Forward on the controller relates to the direction the drone is facing; when it's facing you, pushing forward will fly it toward you. Sometimes, when trying to avoid something, it's easy to fly in the wrong direction (often it's better to shoot straight up). On this occasion, the video connection restores after about 20 seconds. Long enough that I decide to play it safe and bring the Vision+ back in to land. Besides, a small crowd has gathered behind me on the promenade; they're either curious onlookers, or the beginnings of a mob. Later, I take the Vision+ to a quiet location by a harbor. The weather is bright and sunny, with a moderate wind. Setting up the Vision+ for flight isn't difficult, but the last and vital step is to let the drone get a GPS lock -- which takes about 30 seconds. Without it, the drone could drift in the wind and disappear entirely. With GPS lock, when you take your hands off the controller, it'll keep its location. On one flight, I lost the GPS signal, and within seconds the drone drifted 50 feet -- fortunately close to the ground, before ditching. Another use for the GPS is restricted flying zones. With this info loaded, you can't launch your drone near an airport. Or, if you're a bit farther away, you can only fly to a certain altitude. Aviation authorities are still catching up with what to do about consumer drones, but incidents are already taking place that could lead to more restrictive legislation. At one point I take it high above the harbor, and I nearly lose sight of the Vision+. Thanks to the app, I can see what it is seeing. But I can only just see it. It feels weird. You know it's up there, and you can control it, but it's also unsettling -- like riding a bicycle with your eyes closed. Before long, the Vision+ attracts the attention of a local kite flier. He marches over, informing me he'd seen these things online, and that "they go for, what, about £200?" He seems confident with his assessment of what the Vision+ is worth. He tells me I should definitely mention how high it flies in my review. Theoretically it flies to at least 1,000 feet. Maybe more, but I'm too I chicken to find out and bring it down to a more manageable level. Pro tip: This descent feels like it takes forever, especially when you're being scrutinized watched by a know-it-all kite flier. The only other time the Vision+ nearly goes out of visible range is on my second-ever flight. I had it high enough that there was no chance of collisions, with a clear line of sight for its return. The truth is, no matter how confident you are, even with a video feed, flying almost blind is dangerous, flying totally blind would be a recipe for disaster. I guided the drone back assisted by the FPV until I got a better visual on it, but had that link broken (like it did on later flights) It's possible I might have had to consider the GPS/return-to-home mechanism as a fallback. 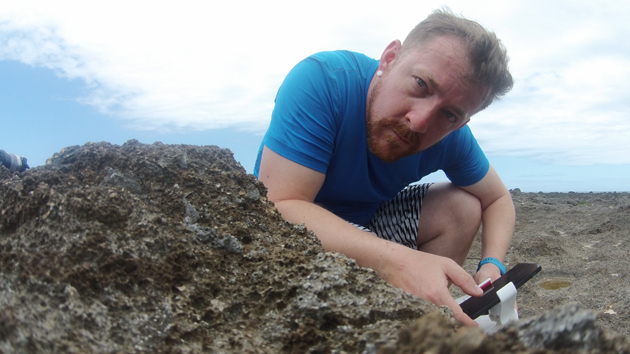 On assignment, I lug the Vision+ halfway around the planet to Hawaii. Fortunately, the drone is incredibly light (1.2kg/2.8 pounds). I bought a backpack built for transporting the Vision+, and I'm happy I did. The case is also light, but rugged, and the drone feels safe inside. It's on this trip I realize how popular DJI's Phantom line is. I spot a number of them, most with GoPros (only the "Vision" models come with a camera built in). While the camera on the Vision+ is decent, the video can appear washed out sometimes, or fuzzy when you move the drone quickly (it's full HD, and also takes 14-megapixel photos). If you want to add your own camera, the popular choice is a GoPro. It's conveniently sized, and has plenty of accessories for attaching it to DJI drones. 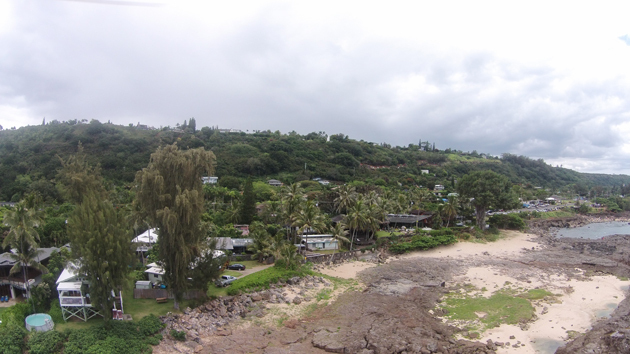 It's in Hawaii that I get a sense of what might be over the horizon in the world of drone flying. Coincidentally, I'm at a GoPro event. It's here I meet, and share the skies with, a number of other pilots for the first time. Standing between two trees, looking out over Kuilima Cove, I meet Roland. I assume he's part of the GoPro party, filming for them. I introduce myself, and learn that Roland's just here on vacation, a drone enthusiast out in the wild, soaking up the coastal views with his DJI Phantom. He tells me he likes to push them "pretty hard," and that he's lost one already (he spares no more details than that). His Phantom hovers over a group of kayakers heading out from the beach. One of them looks up and sees the drone, giving a wave as they pass underneath. Roland's not using FPV; he's just a skilled pilot, and manages to float his craft in the right place from quite far away. If the DJI app has taught me one thing, it's that my depth perception is questionable at best; terrible at worst. It's later when I am flying the Vision+ on the other side of the cape that I have a wake-up call. 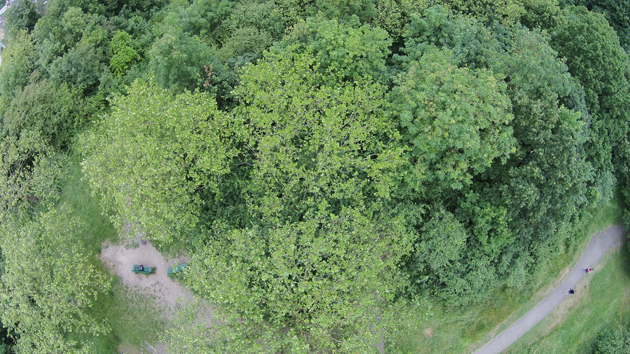 My drone is high, with the camera facing straight down. On my FPV, I see another DJI drone come into view and fly directly underneath mine. It's not Roland; it's yet another pilot. We're both flying above some surfers in the water. I've spotted it, but I don't know if the other pilot has spotted me. Neither of us can see each other, so we're unable to communicate at all. If I take my Vision+ any lower, we'll have a real risk of collision, and with many people below and eight spinning rotors in play, it's risky at best. I bring it in to land to be on the safe side. As fun as flying the drone is, it's a test of your nerves at times. In the weeks I've had the DJI drone, a number of newcomers join the consumer-friendly UAV market. Kickstarter has seen two action/sport-specific 'copters get funded, like Pocket Drone before them. 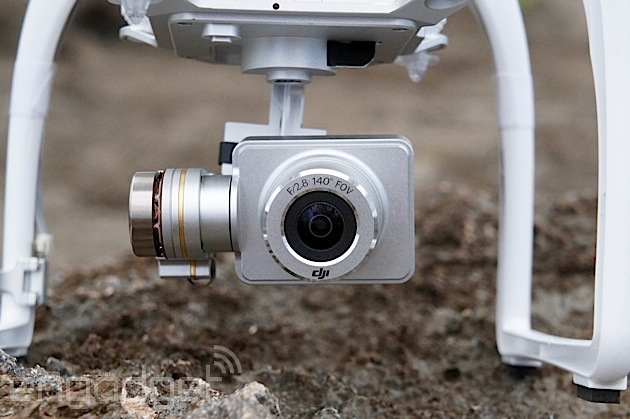 DJI is no doubt already cooking up its next craft, too. That's a lot drones headed for inexperienced hands. My fear is that as numbers increase, people will start flying them in populated or built-up areas. How many news stories will it take before lawmakers re-think current legislation? When I started flying the Vision+, I expected the public to be suspicious. In reality, everyone I met was genuinely curious, or entertained by it. Even when they were aware it had a camera, they seemed OK with it. No one ever told me to move along, or that I shouldn't be flying/filming here. I fear that won't be the case for long. Anxieties aside, I'm hooked on flying the DJI. Already I've been researching scenic locations and accessories to geek out on. At $1,299 (for the camera-enabled model), it's not cheap. But, with new competition on the way, DJI will want to maintain its head start. Given the amount of time between its original Vision and the Vision+ (less than four months), it might not be too long until the next model takes off. With more drones in the skies, the potential for accidents can only increase. How long before there's a defining case, or a change in public perception due to increased privacy concerns? Perhaps, like the cameraphone, the gradual introduction of more flying cameras will lead us to adapt and become more comfortable with them. The only thing for sure is that with drones like the Vision+, that future isn't far around the corner, and the skies will be buzzing with people ready to film it.